As the hearing on the plea for a SIT probe into the Bhima-Koregaon violence resumed on Thursday, ASG Tushar Mehta, appearing on behalf of the state of Maharashtra, continued walking the apex court through the evidentiary material retrieved from the laptops, harddisks and pendrives of the accused activists. In the light of Justice D. Y. Chandrachud’s remarks on Wednesday, he assured the bench headed by Chief Justice Dipak Misra that he shall toe the line of distinction between documents that simply embody an opposition to the government and those which represent a subversion of the law and order against the government. He indicated the mention of guerrilla warfare and Low Intensity Conflict (LIC). The ASG quoted the talk about “transfer of funds towards the expenditure of further operations” and the supply of some other material which he deliberately refrained from naming. He showed that an activist lawyer, who was subsequently arrested, was being scolded for having been unable to arrange the funds and that the advocate even offered a justification. Mr. Mehta referred to a statement in the communications recovered that “there are less enemy forces in these six regions and we will find it easier to ambush”. “Four of these places were actually ambushed!”, he corroborated. “The investigation is ongoing at the ACP level, supervised by the DCP and under the overall care of the DG....the laptops, computers, harddisks, pen drives, memory cards of the accused were forwarded to the FSL (Forensic Science Laboratory) and the time and date of the document and who sent it to whom is clear....we could not have been planting these materials for 6 years only to recover them now....we also have the last log-in and log-out timings which show there has been no interception”, advanced Mr. Mehta. On Wednesday, the ASG had argued that of all the activists rounded up in the investigation, only Advocate Surendra Gadling and Shoma Sen have applied for bail; the others not having done so because “they know what has been recovered from them”. “Even Gadling has not proceeded with his bail application. Should he want to, I have no objections. Your Lordships may direct the bail to be decided on merit”, he concluded. “To say that we subscribe to a particular ideology and hence, cannot trust this government is a motion of no-confidence against the entire system. Then you cannot trust the Maharashtra government or the NIA (National Investigating Agency) or any other entity....there are four tiers of adjudication- the magistrate, the sessions court, the High Court and ultimately, Your Lordships are here. These prayers for a SIT are not called for. It cannot be a ritual in continuation that I am not happy with the investigation, so I will throw some muck and get a SIT”, Mr. Salve rested his case. “The heart of the case diary was distributed! A day later, NDTV held a programme where these letters were discussed. I have attached the CDs and the transcripts of both this programme and the press conference by the ADG of Maharashtra Police”, he continued. Dr. Singhvi replied that he has procured the documents from the concerned TV channels. “Did Parambir Singh (Maharashtra ADGP) flash some letters at the press conference or not?”, inquired Justice Chandrachud. “This is too serious a matter to be filed on affidavit”, responded Mr. Salve. “The incident transpired in December last year, the raids were conducted in April, the first round of arrests was made in June even without an interrogation and then, in August, my batch was picked up on the allegation of some Maoist plot? If the Maoist plot had surfaced in April, why were there no arrests until August? This is an ex-post facto prosecution, this allegation is an afterthought! There is no whisper of a maoist plot in the FIRs! 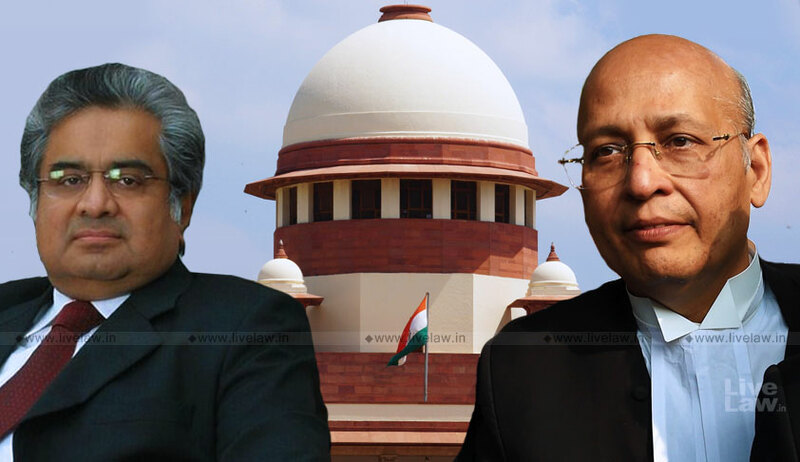 It comes up only in these letters which were found on the computer of a third person and which were not placed on record in any court of law, not even in the transit remand applications!”, Dr. Singhvi pressed. It was his case that such a disclosure would be inadmissible under the Unlawful Activities (Prevention) Act by virtue of section 25 of the Evidence Act. He repeated that the letters are fabricated as they have been either written to or by one ‘Comrade Prakash’, who is none other than Delhi University Professor and Maoist activist G. N. Saibaba and who has been in jail since March, 2017 and consequently, could not have addressed such communications. He reiterated the finding recorded in Saibaba’s conviction order that the latter operates under the name ‘Prakash’. Countering the ASG’s submission that the said order also avers that post the trial, Saibaba had changed names from ‘Prakash’ to ‘Chetan’, Dr. Singhvi said that Saibaba has several pseudonyms, though the name ‘Prakash’ has not been found to correspond to any other individual. “Republic TV had hosted a show on July 4 over these letters. The very next day, Sudha Bharadwaj (advocate and one of the accused activists) had issued a public statement denying it. Subsequently, she had sent a legal notice on July 16. Republic TV had replied on August 7 that they have received the letter from a confidential source and that they stand by it. This is the level of the percolation into the press!”, contended the Senior Counsel. The bench, also comprising Justice A. M. Khanwilkar, reserved its judgment on Thursday.